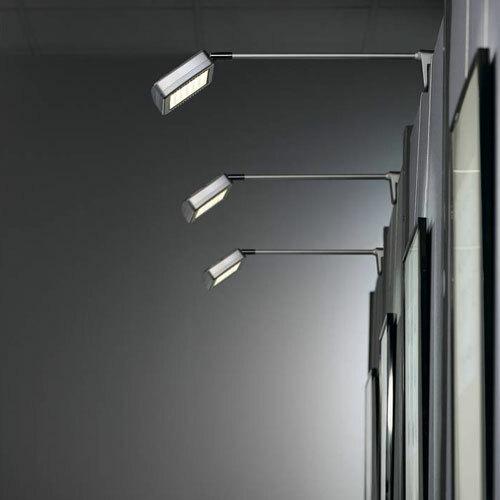 Single & 3 Circuit Track Systems are extremely versatile lighting solutions for exhibitions that can be fixed to ceiling grids or wall displays and the spotlights can be positioned and adjusted to illuminate from all angles. Display Lighting is a leading UK manufacturer and supplier of specialist lighting designed for installation into all types of shell scheme stands and space only exhibitions. The latest product release is the 16W LED Floodlight (DL170401/2). These fittings give a even wash of light to graphic panels and have the same output as a 150W halogen floodlight meaning that more LED fittings can be operated from one socket! Display Lighting offers a pre-wiring service so that multiple spotlights and/or floodlights can be connected together in a "daisy chain" system and operate from a single socket, please contact the sales team for details on 0044 (0) 161 207 3355.